The dining car. Photos courtesy THA. SAMOA – The Timber Heritage Association’s quest to see rail service restored around Humboldt Bay was stoked last week by the acquisition of four mint-condition passenger cars. “Slowly but surely,” THA President Marcus Brown about the effort. Brown recently returned from meeting with the current owners and surveying the cars in Santa Rosa. For Wes and Cindy Vail, the donation to THA is bittersweet. In THA they found a trusted recipient for the passenger cars they lovingly restored, but the transfer also means the end of their own dreams to establish an excursion train. For years, the Vails had been working on a railroad plan in Ashland, Oregon that would incorporate dining and tourist cars, leaving from the city center for loops through the valley. 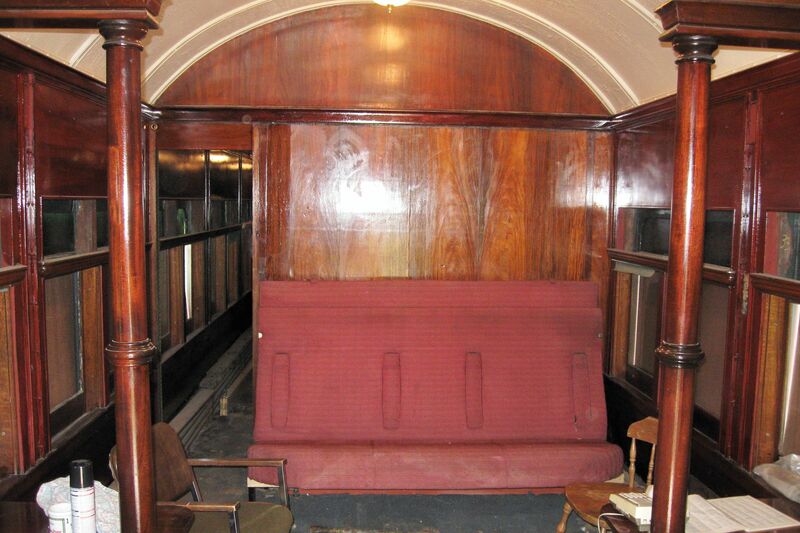 In support, the Vails acquired four passenger cars that included both a business and parlor car that at one time ran Arcata’s Annie and Mary line via Northwest Pacific Railroad. A departure station location was made and all appeared to be going well until Ashland’s City Hall pulled the plug. According to Brown, Ashland’s mayor opposed the project and had the Vail’s excursion train quashed. “They had a lot of money sunk into it,” Brown said. Since, the cars have languished at Santa Rosa’s Historic Railroad Square – the Depot. However, the Vails are eager to get them out of the location. According to Brown, the cars are frequently graffiti tagged and broken into. The dining car in particular is a carefully restored piece of American rail history, with inlaid wood, stained glass and original gas lamps. Having already lost the Ashland line, the siege of the cars is too much for the Vails to witness. 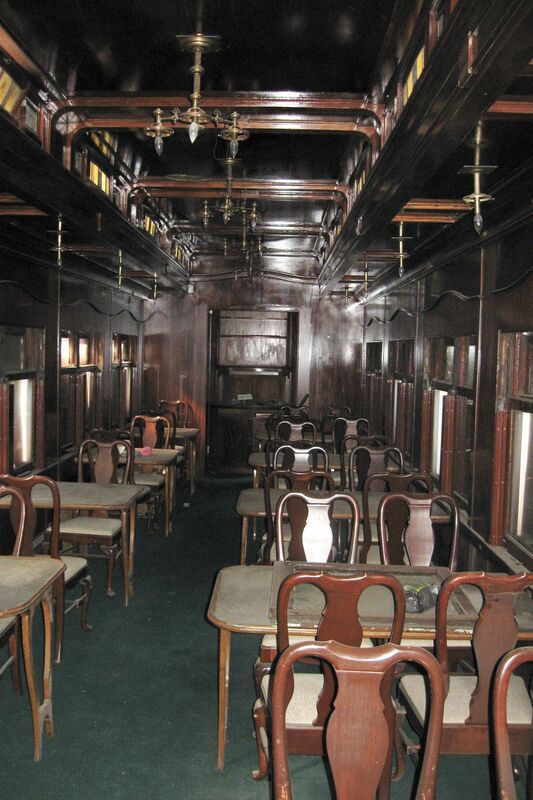 The dining car's elegant interior. The couple was also looking at donating to an alternative rail group. But at the last visit, Brown pointed out that returning the business and parlor to their Humboldt line would be a huge coup for railway history. The Vails agreed and made the donation official. Then there’s just the minor issue of getting tons of passenger steel and iron up to THA’s museum at the Samoa Roundhouse. Brown said the shipping is estimated at $10,000 a piece, likely well beyond the non-profit’s ability to cover soon. Rescue has come in the form of Northwestern Pacific (NWP) owner and operator John Williams. “He wants to see the tourist train going and has the goal of having the railroad running around the bay,” Brown said. Brown said that a bay-round tourist train would likely be pulled by Annie & Mary Diesel #1, awaiting service in Samoa, and would include five coaches now in Portola and Brown’s caboose housed in Scotia. Regardless, the return of Humboldt Bay rail service is certain, beginning in June. THA’s Speeder rides will start on Saturday, June 26 for 30 minute trips running the line between Samoa and Manila. THA volunteers are refurbishing a car that the Speeder will pull, increasing capacity for the popular jaunts. The rides will continue through the summer on the fourth Saturday of the month between 9 a.m. and 4 p.m. and include free tours of the roundhouse train museum. An online booking system is pending. More at timberheritage.org. This entry was posted on Thursday, April 29th, 2010 at 10:12 am	and is filed under News. You can follow any responses to this entry through the RSS 2.0 feed.